This is a truly famous surname whose Gaelic-Celtic ancestry pre-dates Christianity. Originally, the name was purely personal and spelt as "Morcant", the change to Morgan being medieval. The exact meaning is uncertain but "sea chief" or "sea defender" are the generally accepted interpretations. The importance of the name is shown by its incorporation in the ancient Welsh kingdom of Glamorgan, a corrupt form of "Ap Morgan", the son of Morgan. The first true recording as a surname is however English (see below). In Wales the first recording may be Thomas Morgaine, Knight of Monmouth, in 1538, whilst in Scotland, one John Morgane was a burgess of Glasgow in 1419. In Ireland the name is popular in Leinster and Ulster, and in some cases is an Anglicization of Merrigan and Morahan, the first recording being that of Edward Morgane, of Dublin, on April 26th 1654. 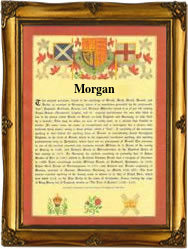 Not only does the name indicate a sea warrior, it is with the sea that the Morgan name has won most renown. Amongst these famous people was Sir Henry Morgan, Governor of Jamaica and the epitome of the privateering buccaneer of the 17th Century. The first recorded spelling of the family name is shown to be that of John Morgan, which was dated 1214, in the "Curia Regis Rolls of Berkshire", during the reign of King John, known as "Lackland", 1199 - 1216. Surnames became necessary when governments introduced personal taxation. In England this was known as Poll Tax. Throughout the centuries, surnames in every country have continued to "develop" often leading to astonishing variants of the original spelling.